This link as above refers to my this current year three prayer request. Only the first one answered which is found a job. The rest of the two not answered. For the second request, even I found a friends who like to go out with me for a simple meal or movie like fortnightly once since June this year, but we are not yet going into stable relationship. Seems like I do not want to married soon, getting more freedom is better for me even parents wants me to get married. Even I getting old, I should be in old folk home not easy feel lonely till death as I normally a lonely person doing lonely hobbies. If going to marry, a lot of commitment, then naturally we will have family even more commitment as even compare to still single we face the same chances of getting ill also which I believe. For the third one not answered, I am not recovered from mental illness, getting lesser to exercise as I finish all my personal training sessions in gym to rely on personal training too much. If I have no personal trainer, cannot be able to exercise on my own regularly. Medication dosage is increased double and a new medicine to take maybe doctor thinking I will be more stable in this way. 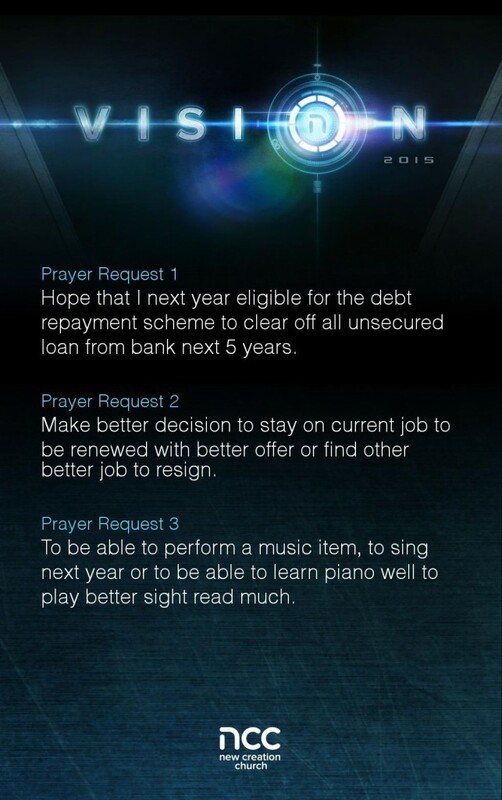 Below is my new three prayer request for new year, hopefully it is not too hard to be answered to be easier not like this year.